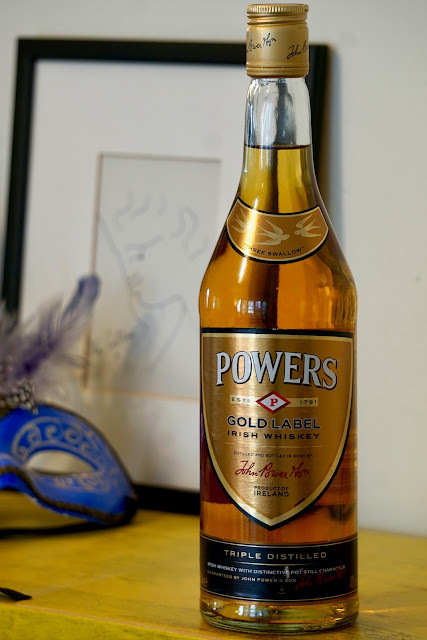 Powers Gold Label (2009 - 2013) (40.0%): Although I reviewed Powers Gold Label before here on tire-bouchon before that bottle was a release right after the brand received the major face lift in 2013... This one on my desk is from an earlier era most likely between 2009 and 2013 and bottled at a lower strength at 40% abv. It was also priced slightly less before. As you already know Powers is blended by pot still and grain whiskeys distilled in New Middleton Distillery in County Cork. The blend has a larger ratio of pot still whiskeys to grain whiskeys compared to its sibling Jameson. It has been my favorite budget Irish whiskey since I moved to US in 2003... Perfect companion to a pint of Guinness and the best base for an Irish coffee. Let's unscrew its old school screw cap and remember how it was back then. Color: Yellow gold, lemon zest. Definitely lighter in color than the current version. Slow and thick impressive legs. Nose: Young grain whiskey, lemon scented floor cleaner and fresh cut grass. Apple compote, fresh quince and rocket leaves. Candle wax and honeycomb. It noses like a dive bar... In a beautiful way. Palate: Honey syrup, green bell peppers and white peppercorns. Lemongrass, furniture polish and hard lemonade. Water from a metal flask and fudge... I returned back to it after almost ten minutes and was pleasantly surprised how much airing helped. It must be the old bottle effect. Now the harshness and the disturbing young whiskey notes are all gone: Cheap honey, nutmeg, brown sugar and ground cloves. It's sweeter, less citrusy and thicker. Finish: Medium, mostly with lemon zest, copper pennies and young alcohol burn. After allowing it to air: Baklava syrup, cinnamon and nutmeg. Overall: I have to admit that the current version is a touch better... It feels slightly older and more dense on the nose, more layered and textured on the palate. That slight abv increase looks like worked pretty good and yes, it certainly justifies the $5 price increase. But... I have to explain here why I still have a massive soft spot for these older bottlings. This whiskey brings so many memories. Bone shattering cold winter days, watching New York Yankees games with my dear friends in our neighborhood bar, pints of beer jugged one after another and Brooklyn and New York City... Unbelievable how a glass of whiskey can recall so many beautiful memories the moment you nose it. I am so glad that I scored this bottle that cheap on an online auction. Worth every single penny... If I could find a whole case I would definitely buy it.